Nearly 4,000 solar panels, covering an area the size of two football fields, have been installed at the site of the 1986 nuclear disaster. At ground zero of Ukraine's Chernobyl tragedy, workers in orange vests are busy erecting hundreds of dark-colored panels as the country gets ready to launch its first solar plant to revive the abandoned territory. The new one-megawatt power plant is located just a hundred meters from the new "sarcophagus," a giant metal dome sealing the remains of the 1986 Chernobyl accident, the worst nuclear disaster in the world. 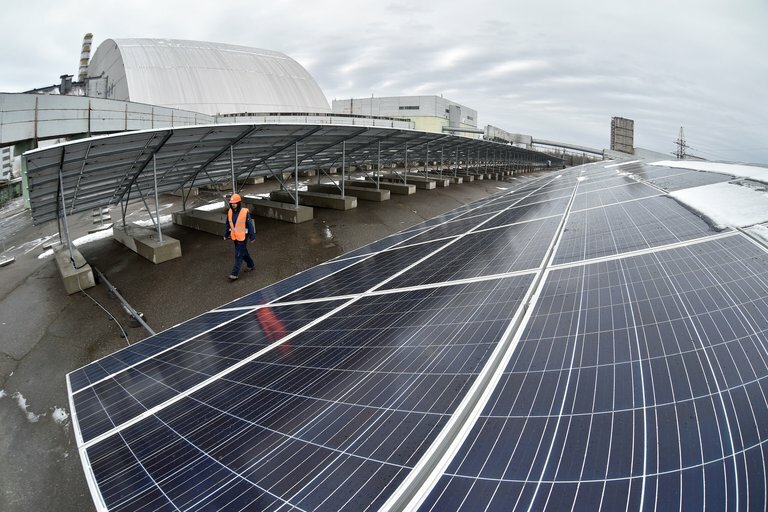 "This solar power plant can cover the needs of a medium-sized village," or about 2,000 flats, Yevgen Varyagin, the head of the Ukrainian-German company Solar Chernobyl which carried out the project, told AFP. The solar installation is to go on stream within weeks, the company said. The group has spent one million euros on the structure which has about 3,800 photovoltaic panels installed across an area of 1.6 hectares, about the size of two football fields, and hopes the investment will pay for itself within seven years. Eventually, the region is to produce 100 times the initial solar power, the company said. The amount of sunshine "here is the same as in the south of Germany," said Varyagin. Ukraine, which has stopped buying natural gas from Russia in the last two years, is seeking to exploit the potential of the Chernobyl uninhabited exclusion zone that surrounds the damaged nuclear power plant and cannot be farmed. Reactor Number Four of the Chernobyl plant exploded April 26, 1986 and the fallout contaminated up to three quarters of Europe, according to some estimates, especially hitting Russia, Ukraine, and Belarus. Following the disaster, Soviet authorities evacuated hundreds of thousands of people and this vast territory, over 2,000 square kilometers wide, has remained abandoned. The plant continued to operate the remaining reactors, the last of which was shut down in 2000, ending industrial activity in the area. People cannot return to live in the zone for "more than 24,000 years," according to the Ukrainian authorities, who nevertheless argue that a prudent industrial use can be possible again. "This territory obviously cannot be used for agriculture, but it is quite suitable for innovative and scientific projects," Ostap Semerak, Ukrainian Minister of the Environment and one of the promoters of placing solar projects in Chernobyl, told AFP in 2016. The installation of a huge dome above the ruins of the damaged reactor just over a year ago made the realization of the solar project possible. Funded by the international community, it covered the old concrete structure which had become cracked and unstable, to ensure greater isolation of the highly radioactive magma in the reactor. As a result, radiation near the plant plummeted to just one-tenth of previous levels, according to official figures. Even so, precautions are still necessary: The solar panels are fixed onto a base of concrete blocks rather than placed on the ground. The soil remains contaminated, explained Varyagin, whose group is a joint venture between the Ukrainian firm Rodina Energy Group and Germany's Enerparc AG. "We cannot drill or dig here because of the strict safety rules," he said. Last year the consortium completed a 4.2-megawatt solar power plant in the irradiated zone in neighboring Belarus, not far from Chernobyl. Ukrainian authorities offered investors nearly 2,500 hectares (25 square kilometers) for potential construction of solar power plants in Chernobyl. Kiev has received about 60 proposals from foreign companies — including American, Chinese, Danish, and French — who are considering participating in future solar developments in the area, according to Olena Kovalchuk, spokeswoman of the State Administration for the zone of Chernobyl. Investors are attracted by the price that Ukraine has set for solar electricity, which "exceeds on average by 50 percent of that in Europe," Oleksandr Kharchenko, executive director of the Energy Industry Research Center, told AFP. He added that cheap land and the proximity of the power grids makes Chernobyl particularly attractive, though there is still no rush of western investors to the region. Safety concerns and Ukraine's notorious bureaucracy and corruption has put some off. "It is very important to have guarantees that working in the Chernobyl zone will be safe for those who will be doing it," said Anton Usov, adviser to the European Bank for Reconstruction and Development. The bank does not currently foresee any investment to Ukraine in this field.